• Baby Sign Language - Baby sign language is a way to communicate with a baby as young as six months old. Get a glimpse into your baby's world. Using hand gestures a baby can communicate often more than a year before they can speak. Reduce frustration, less fussiness and have more fun. • Baby Milestones - Find out when your baby might walk, talk, crawl, grasp objects and other fantastic firsts from birth to 24 months. Keep track of those milestones in your baby's development and compare the progress of typical baby. 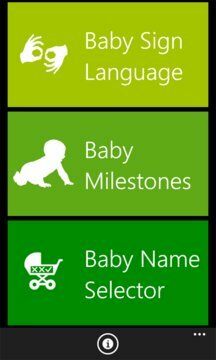 • Baby Name Selector - Stop worrying that you're missing the perfect name for your baby. No brainstorming required. Use this app independently with your spouse and pick your top 5 choices and compare your selections. Starts with a massive database of essentially every name ever used in the United States: 36,065 boy names and 60,438 girl names. After you choose a gender, the app enables you to quickly narrow down the list with a variety of filters. Download Best Baby Apps today free and get Baby Sign Language, Baby Milestones and Baby Name Selector in one app!